Morris Lubricants is once again entertaining the ‘growing army of Eric the Turkey fans’ with an annual festive episode about the adventurous bird – and this year there’s another beak to feed…. 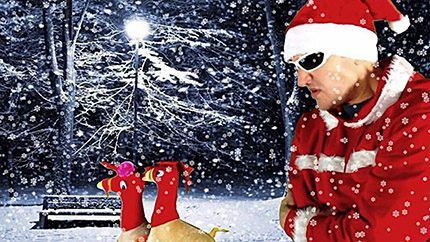 Eric is the creation of automotive products manager Adrian Hill, who has composed catchy Christmas songs and videos about the escapee turkey for the past five festive seasons. His mission is to add some much-needed humour to the Christmas celebrations. Eric’s latest adventure, Eric the Turkey’s Christmas Nativity, has caused a few feathers to flutter and already has a good following on YouTube – https://youtu.be/qPYgFRR6Jls – and Adrian’s family, friends and workmates love the video. This year, Eric and his partner, Erica, go to the city to visit friends and get snowed in. They are forced to look for somewhere to stay and find a Premier Inn where a precious parcel – an egg – hatches on Christmas Eve. Baby Eric is born. Adrian hit on the idea of an avian-themed nativity story soon after completing last year’s video and is already thinking about Eric’s next adventure. “People like this year’s video because it’s a proper Christmas theme with a happy ending,” explained Adrian. “It’s a joyous occasion because there is a new member of Eric’s family. “What I am going to do after Christmas is run a competition to name the baby turkey and the prize will be a specially designed Eric the Turkey T-shirt. In a break with tradition, Eric even went on a summer holiday with Adrian and his family this year, which was the theme of another video. Taking Eric abroad together with inflatable pink flamingos to make the ‘Eric’s Summer Party’ video caused more than a few strange looks at the beach.